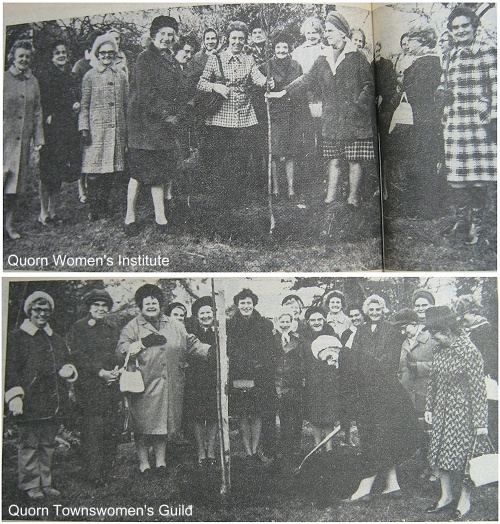 Members of both Quorn Women's Institute and Townswomen's Guild held a joint tree planting ceremony on County Council land in High Street, Quorn, on Friday as part of their contribution to the "Plant a tree for 73" campaign. After planting the trees members of both organisations returned to the Rawlins College common room for afternoon tea provided by the WI. The County horticultural officer, Mr N Waumsley, who was present at the ceremony, spoke of the great need for the planting of such trees in the future. The trees were planted next to the the old Methodist Chapel on High Street, opposite to what is now (2011) Aidan Reeds estate Agents. Picture one: Mrs A Bayliss (left) the WI president assisted by Mrs M Macdiarmid (vice-president) and Mrs D Organ, the institute's founder member, plants the WI Red May tree. Picture two: Mrs B Cryer (left) the Townswomen's Guild chairman holds the Guild's Rowan tree while senior member Mrs A Pinches fills in the hole. Fifth from right - Margaret Halford (white hair). Just to the left and behind her (small lady, dark hair) is Phyllis Sharpe (auntie of Sue Sharpe) and to her left (pale coat, taller, dark hair) is Joyce Sharpe (mum of Sue Sharpe). The tall lady in the dark coat to the immediate right of the tree is Mary Webb. Submitted by: Kathryn Paterson with additional information by Sue Sharpe.